Summary: I first walked the long line of high mountains separating Ennerdale Water from Buttermere and Crummock Water which extends west to east from Great Borne to Haystacks during the second stage of my high level Coast to Coast walk of 1999. I had been smitten that day by the vast spread of high ground on the western side of the high ground and which narrowed as I was channelled eastwards across the series of mountains forming the barrier between dales. 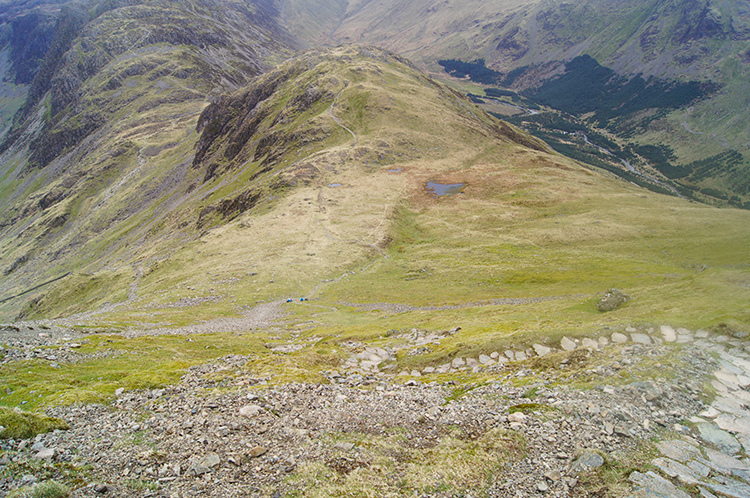 I particularly remembered reaching the high point of the walk on dishevelled High Stile and I also remembered the awesome gob-smacking moment when I looked down from Gamlin End just beyond High Crag to Seat and Haystacks. I had so much wanted to revisit those moments and more besides. Eighteen years on I returned and here is the story. After leaving the car in the parking area just above Wainwright's chapel in Buttermere I set off on my way by walking down the road and into the village of Buttermere. I could not help looking directly ahead of me and up to the mountains I would be crossing later on in my walk. They were all there, waiting in line. I tipped my head to them and walked through the village and then on to the path leading to the north-west tip of Buttermere Water. Though it was still relatively early in the morning there were plenty of walkers to keep me company. I counted at least a dozen ahead of me as I made my way to the waterside where I stopped to take in the beauty of the view across Buttermere to Fleetwith Pike. The calming scene quietened everything, dismissing the other people completely from my senses while I looked up to the path bisecting the spine of Fleetwith Pike which I had scrambled down on a couple of occasions. After a couple of minutes meditation I turned and resumed my walk. At where the Dubs filtered Buttermere's water into Crummock Water I turned right. Everyone else around bar one other had turned left. 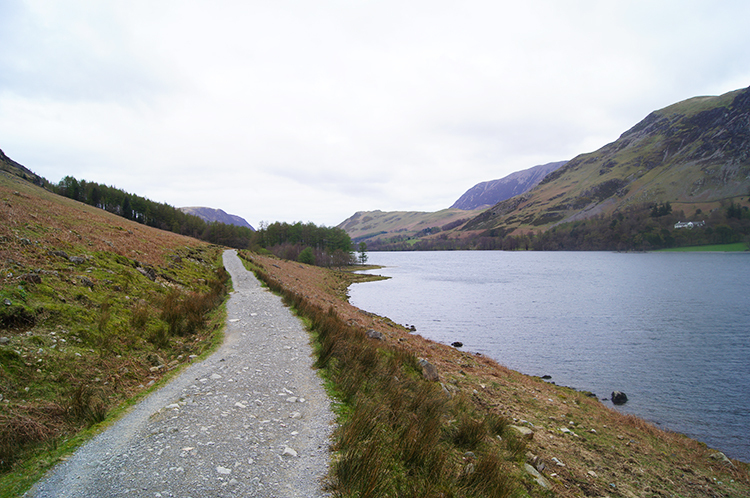 I followed the path running parallel to Buttermere Dubs towards where the linking watercourse flowed into Crummock Water. 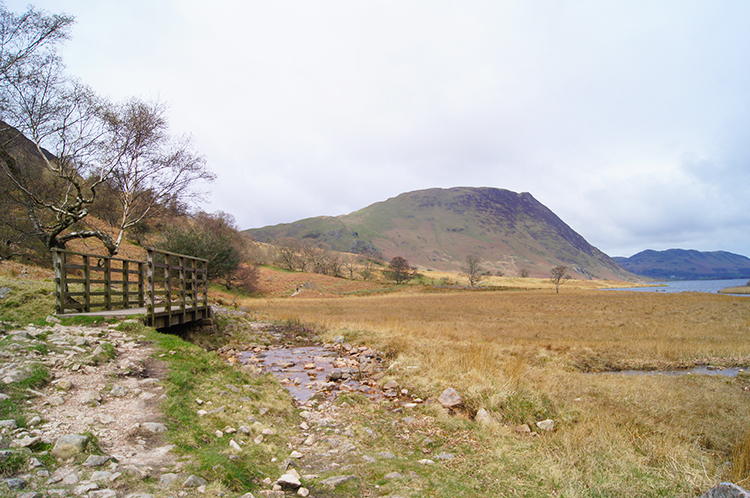 As the path climbed slightly I looked straight ahead into the waters of Crummock Water. Brooding clouds were scuttling across the sky from the south-west. They covered the top of Grasmoor and lapped the top of Mellbreak. That told me they were crossing over me at around 450 metres high. As I looked at the clouds racing overhead I was reassured by the words BBC weather forecaster who in the morning bulletin had suggested they would get higher as the day elapsed. Comforted with the though I carried on with my walk and passed the small land form of Scale Island within Crummock Water to reach Scale Beck. Here I took a deep breath and began climbing. I was facing a 440 metre climb to Lingcomb Edge where I would get a brief respite before climbing a further 280 to my highest point of the walk on High Stile. No more putting it off then, it was time to get going. I set off climbing with my first objective being Scale Force. I hauled myself up in stages, a prescribed number of steps, catch my breath, number of steps, catch my breath, repeat... After a while of repetitive effort I looked up to see the solitary walker I had seen earlier just ahead of me. Though I had closed on my leader I did not catch up, the walker went ahead as I took another pause and disappeared. I missed the best view of Scale Force in all the effort of climbing too though the waterfall had not been my objective. Climbing eased at around 330 metres altitude and by then the waterfall was below me. Onward I went, closely alongside Scale Beck. Occasionally small waterfalls in the beck entertained me. Some of them were very pretty. The clouds which had capped Mellbreak when I had started the climb from besides Crummock Water were higher when I took the time to stop and look back down the line of Scale Beck and across to the mountain. The clouds had lifted to over 500 metres and now all of Mellbreak was showing. I turned my head from looking back and looked forward. For the first time in almost eighteen years I could see the summits of both Starling Dodd and Great Borne and the path I took between them during my 1999 Coast to Coast walk. It brought back great memories and in my mind I pictured my late and dear friend Deke who was walking with me on that memorable day. I'll be darned I had a tear in my eye. 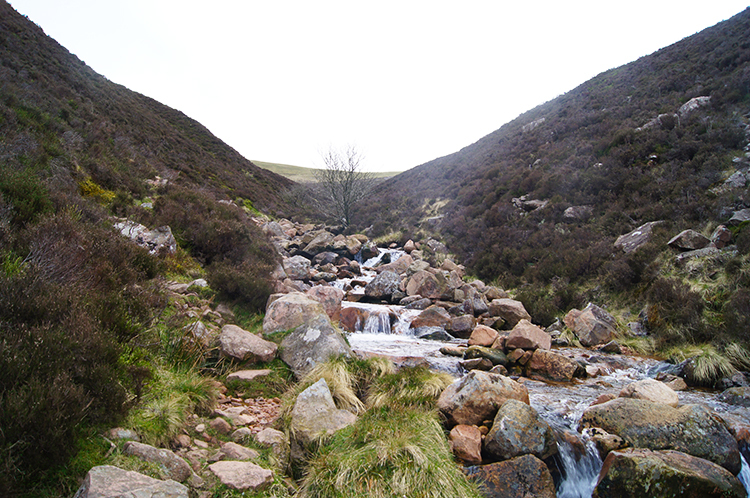 I was smiling though, it was such a happy revisit to my past and I hastened my walk leaving Scale Beck behind and continuing my climb to Lingcomb Edge where I could pick up my old footsteps. I was in rapture Once I had reached Lingcomb Edge. Firstly I reminded myself that I had attained my first height gain objective of 550 metres above sea level. 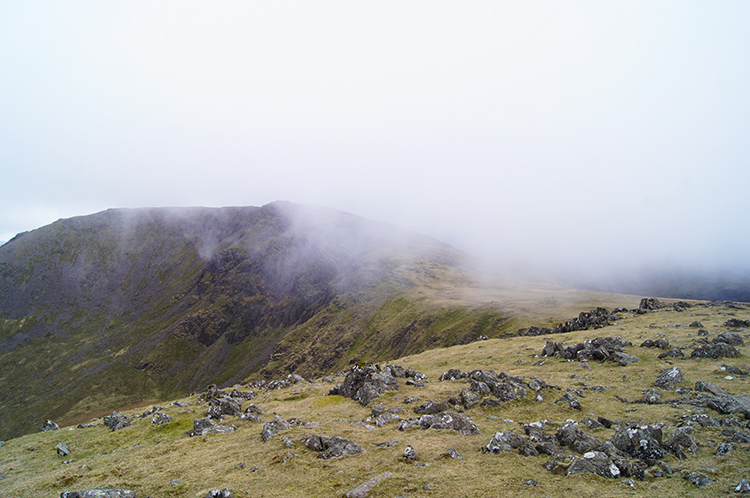 Secondly I was pleased to see I was not enshrouded by cloud which I would have been if up here earlier in the day. It had continued to lift as I had climbed up Scale Beck and across to Lingcomb Edge. Thirdly the mountains ahead of me were all free of cloud too. All was good while I rested beside the edge and looked down into the dale of Buttermere. I looked north-east across the valley to impressive ridge line from Knott Rigg to Ard Crags which I had walked on my last adventure from Buttermere. 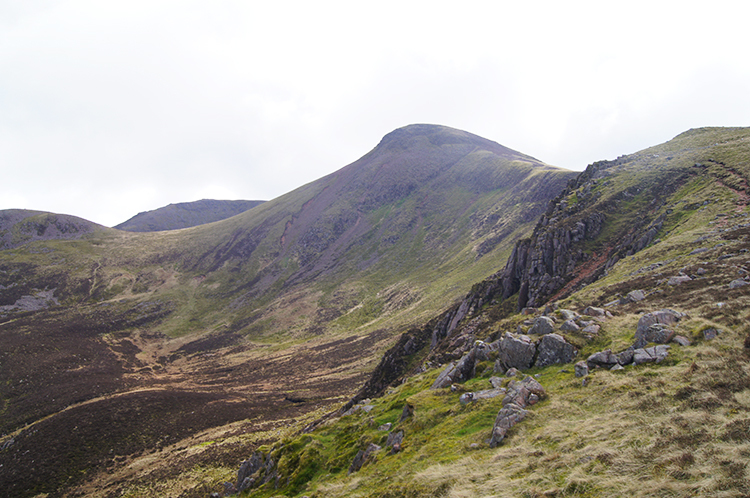 I noted Robinson too, another favourite mountain of mine which I had topped during a Newlands Horseshoe walk. After my sightseeing on Lingcomb Edge I focused on my next task in hand and climbed steadily along the east edge of the massif and up to Red Pike. The more height I gained, the more upland terrain I appreciated. Looking back to the north I could now spot Loweswater appearing to the left of Mellbreak. Another familiar range of lesser fells including Hen Comb, Gavel Fell and Blake Fell also showed into view beside Loweswater. They too I had explored in fairly recent Lake District adventure. 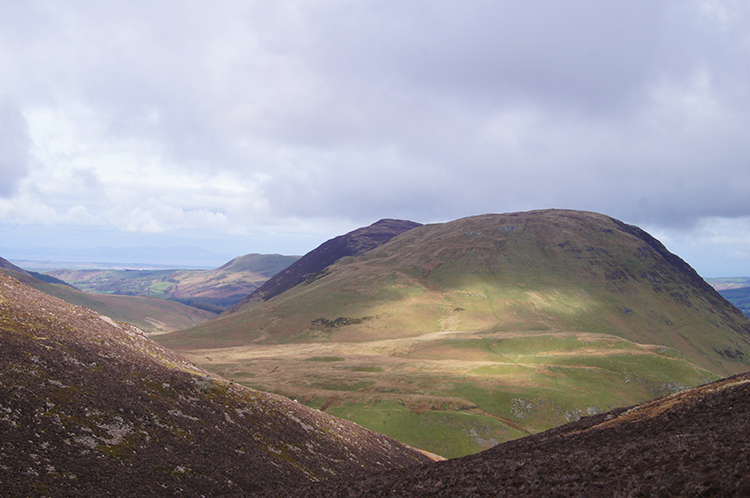 As I looked at them I noticed cloud sweeping in from the west and filling in the space across the chasm of Ennerdale. I stood and watched it sweep over Great Borne and Starling Dodd, blanking both out from my view in what seemed like an instant. Then I stood and watched the cloud shroud over High Stile. Perhaps I would have to venture into the fog of cloud on this walk after all. The cloud that had swept in over my chosen range of mountains had missed one out. With great fortune it had left Red Pike alone so for the time being I was out of it. 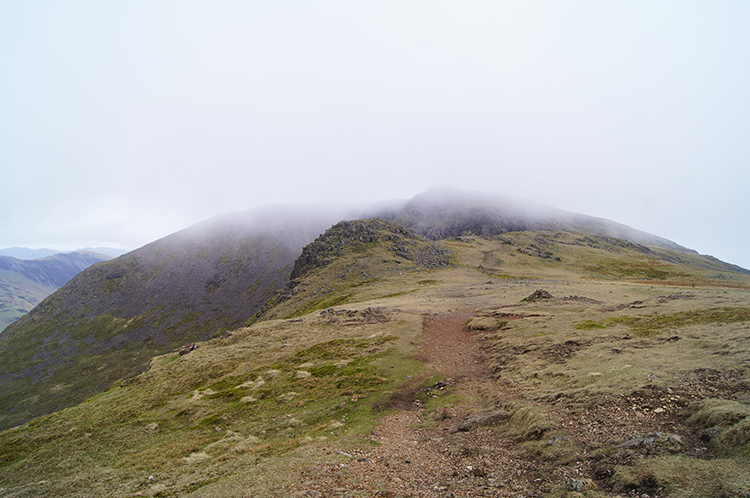 I watched from my window of visibility on Red Pike as it stopped over High Stile and appeared to hover. 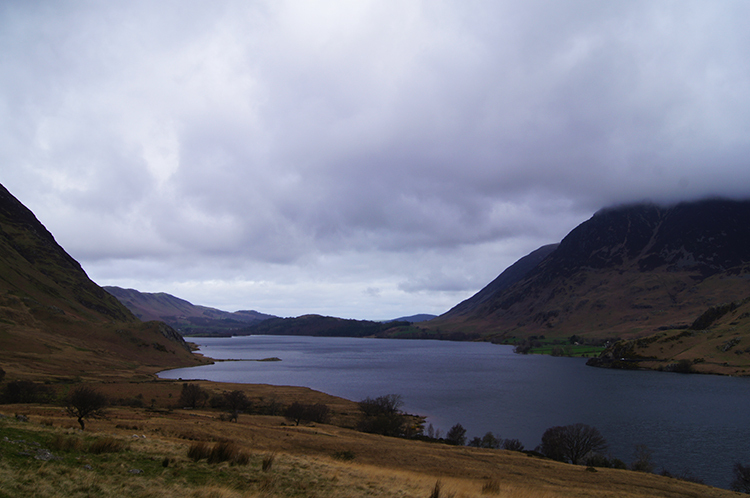 The cloud that crossed over it to the Buttermere side frizzled away but cloud that hung around High Stile stayed. Still I hoped it would be gone before OI got there which was 50 metres higher and just over a kilometer away. I set off towards the cloud as it lingered but as I walked along the path on the edge of Chapel Crags the summit of High Stile began to invitingly peek out again. If I had wanted to run into the cloud I would not have managed as it elusively shifted just like the end of a rainbow does. By the time I had walked my kilometer and reached the high point of my walk the cloud had gone. For good. 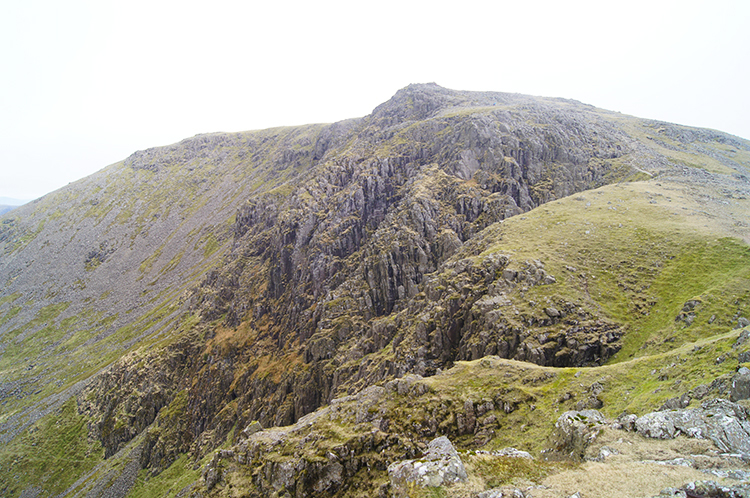 High Stile is 807 metres high and at number 29 just makes it into the Wainwright's Top 30. 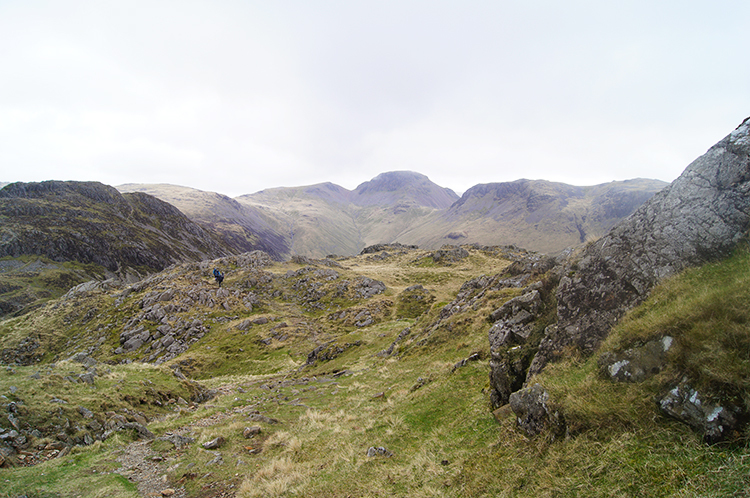 From High Stile many mountains can be seen including Scafell Pike, Skiddaw and Helvellyn. 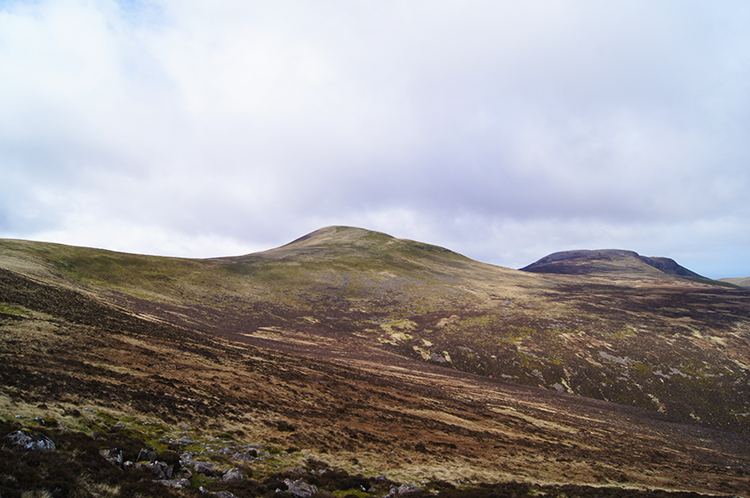 On a clear day the Isle of Man can also be seen by looking west directly over Lank Rigg. 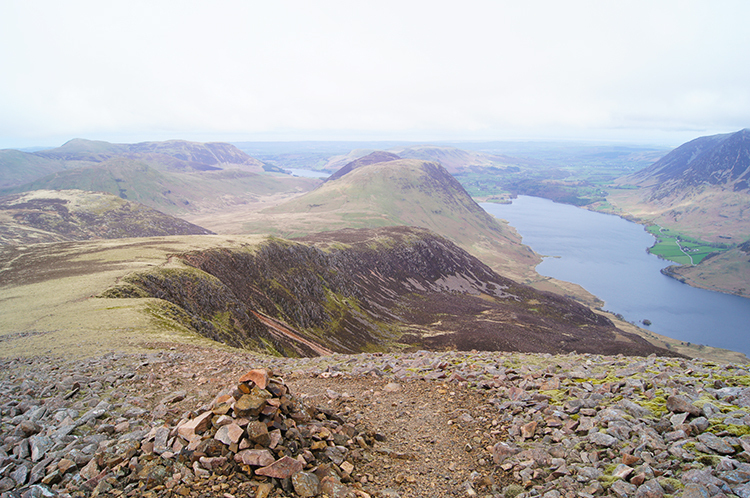 Of all the views on offer from High Stile though Wainwright particularly liked the dramatic view looking north-west across Bleaberry Tarn and Crummock Water which extends to the Solway Firth. Mountains in the view include Dodd which is linked to Red Pike by the Saddle and which frames Bleaberry Tarn perfectly and also both Mellbreak and Grasmoor. 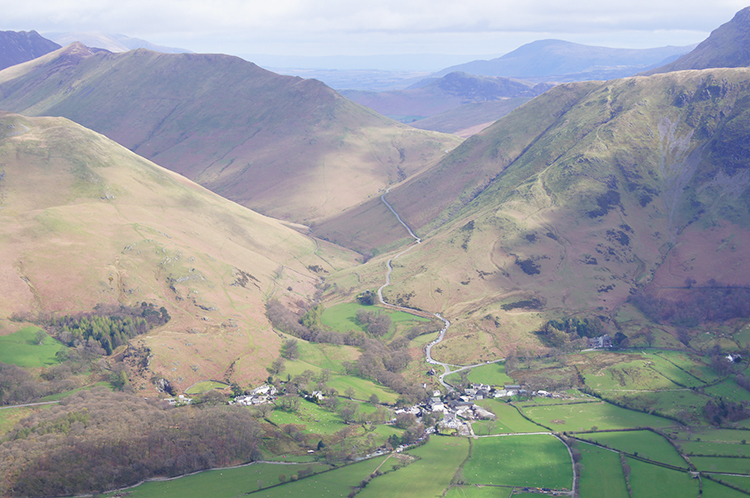 I agree with Wainwright, it is the best view on offer from High Stile and one I gazed out to for quite a while. 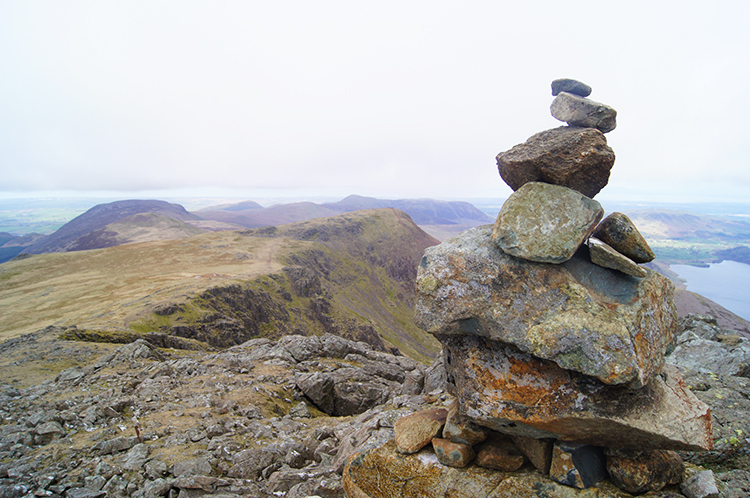 The summit area of High Stile is marked with a cairn and the surrounding area covered in an explosion of small rocks and stones. 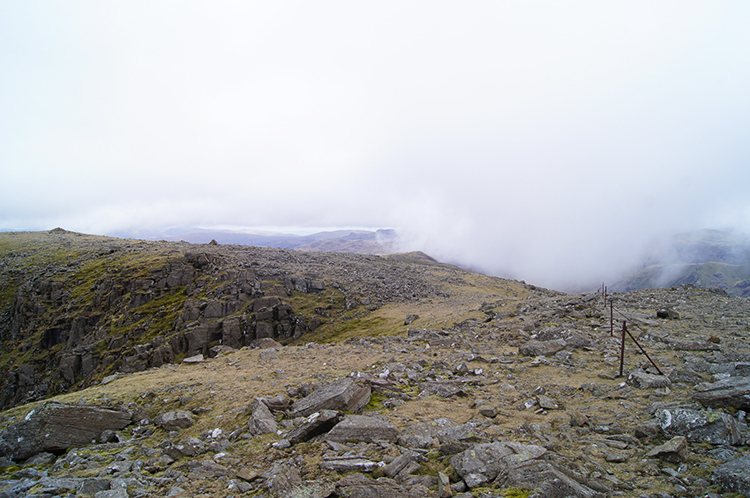 Leading away from the top towards High Crag is a line of iron fence posts. They have not changed since 1966 when Wainwright published his seventh and final guide to the Lakeland Fells, the Western Fells in which he wrote "A woe-begone series of fence posts, shorn of all connecting strands, pursues an erratic course across the stony top, and now serves a purpose, not originally intended; that of guiding woe-begone walkers to safety". If the cloud had stayed down maybe I would have needed their guidance. 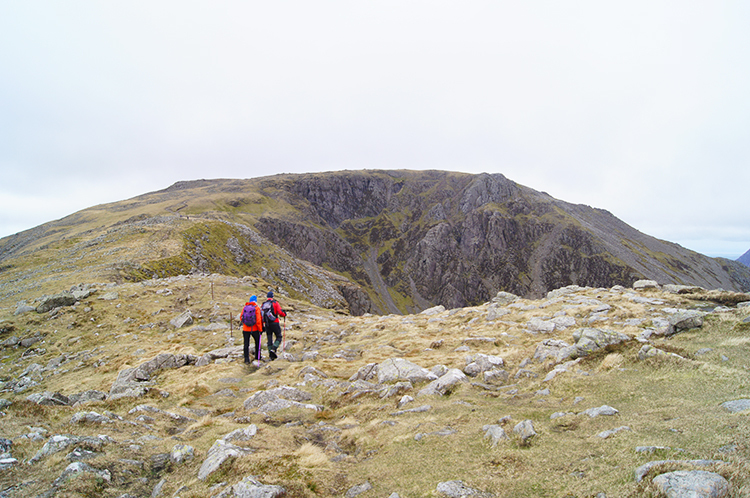 In the event I did not, instead walking assuredly from High Stile south-east along the saddle linking the mountain to High Crag. From High Stile my walk of the massif was all downhill. The gradient that is, not the enjoyment. The elevation profile for the walk is practically a mirror image and in fact the thrills of my return journey to Buttermere were to be equal to the thrills of the climb from the village to High Stile. First of all was the lovely walk along the high level and narrowing band between High Stile and High Crag. The thin strip of high shelf between the two allowed me to enjoy great views into the two valleys separated by their mass. By casting my eyes down to my left I looked into the deep waters of Buttermere and the head of the valley straddled by Fleetwith Pike. By looking right I looked down into Ennerdale. I looked to the path of the River Liza and to the parallel footpath through Ennerdale Forest, the very path I walked on my first Coast to Coast walk in 1994 which is widely recognised as the worse section of Wainwright's great long distance walk. I agree completely, it was a dirge. I could spot the very popular Black Sail Hut at the head of Ennerdale and follow the path along Tongue and leading out of the valley to Windy Gap between Green Gable and Great Gable. By looking further around to my right I could also now see Ennerdale Water and the kink in the lake where it swings around Robin Hood's Chair. I sat on the chair once. 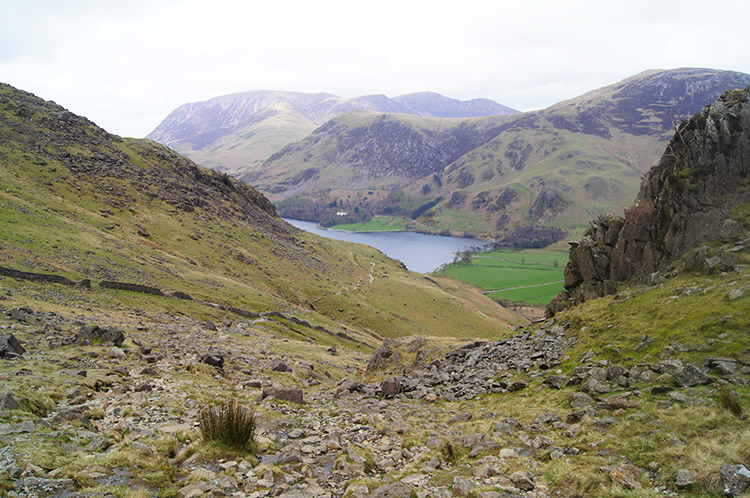 I looked down from High Crag to the path which steeply drops from Gamlin End to Seat. It is a marvellous picture with the heights of Haystacks in picture directly beyond Seat. I stood before making the descent and admired it while evoking the delicious memory of the first time I viewed it in the last summer of the last century. When the view was sufficiently refreshed into my minds memory map I took my leave of High Crag and shuffled my way down the steep path. 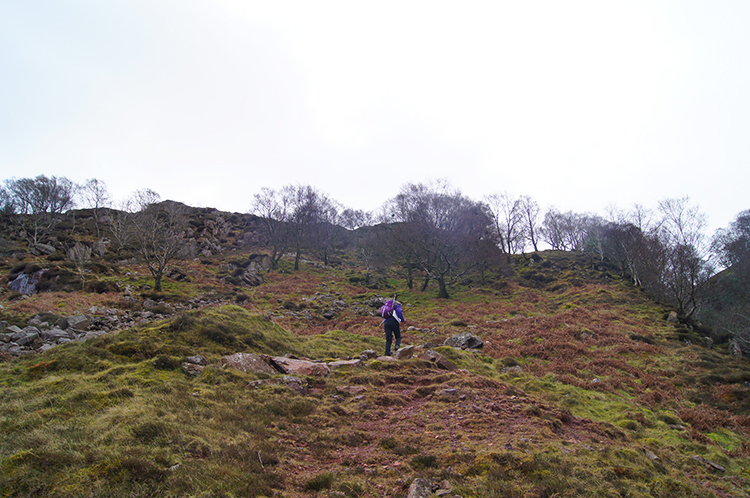 A walker who had started the descent before me was more cautious; halfway down I said hello while overtaking him. I continued my good pace downhill and got to the level ground leading over Seat along with the physical effect associated with hard descents pulsing through my legs. I had no twinges or strains though which I used to suffer with twenty years earlier. My feet and legs had hardened to long walking and mountain effort over many hard miles since then. 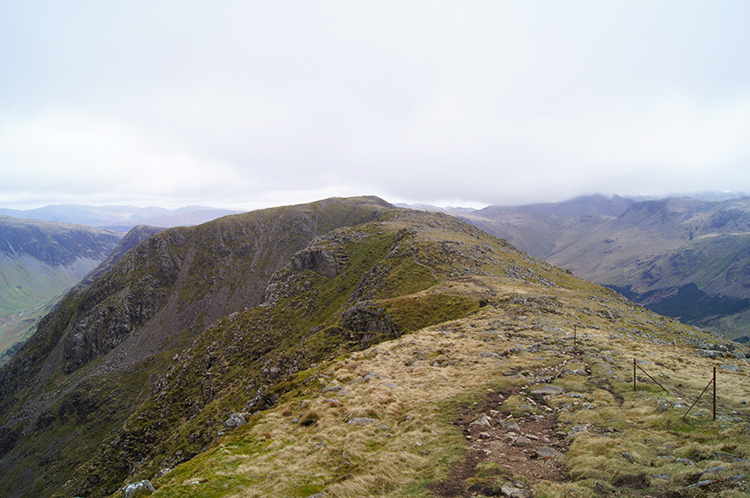 Consequently I bounded over the hump that is Seat and around to Scarth Gap. 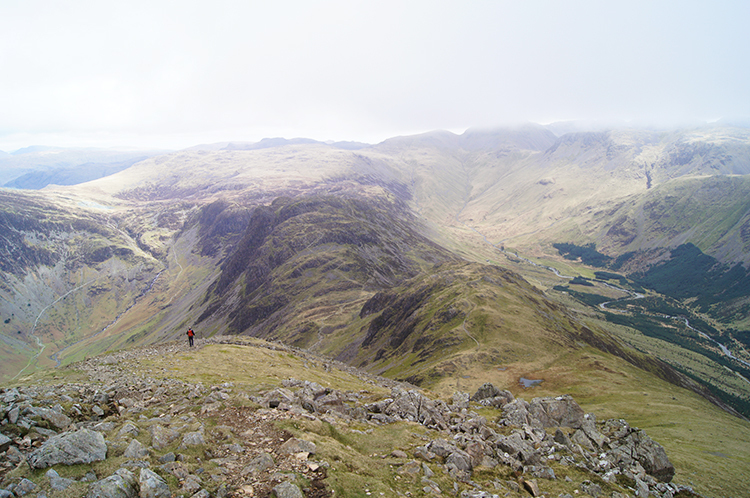 When I reached Scarth Gap I contemplated climbing over Haystacks and returning to Buttermere via Warnscale Bottom. I decided against it, having crossed over Haystacks quite recently. 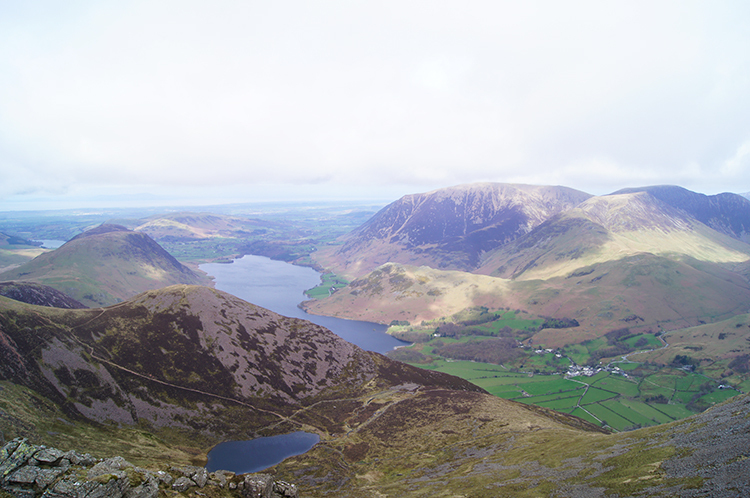 so I continued on my descent to Buttermere by way of the familiar path via High Wax Knott and Warnscale. Herdwick Sheep were grazing on the slopes as I walked on down and past them. They were no bothered about me, they continued to nibble away. 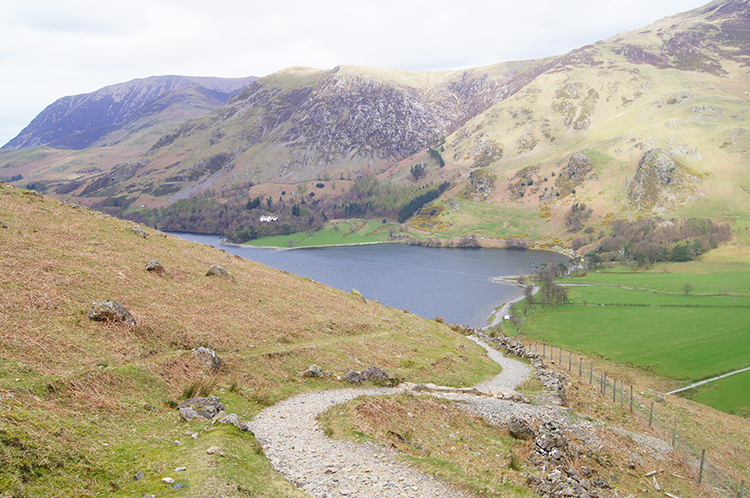 After passing Warnscale and a small copse at Low Crag I reached the path leading around Buttermere to Gatesgarth. My ups and downs for this walk were over. I was back on the level. 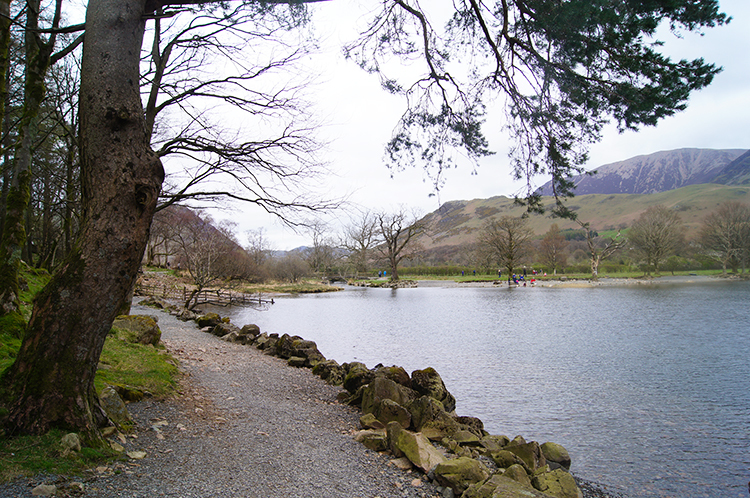 All that remained of my walk was the enjoyment of a stroll along the west bank of Buttermere. 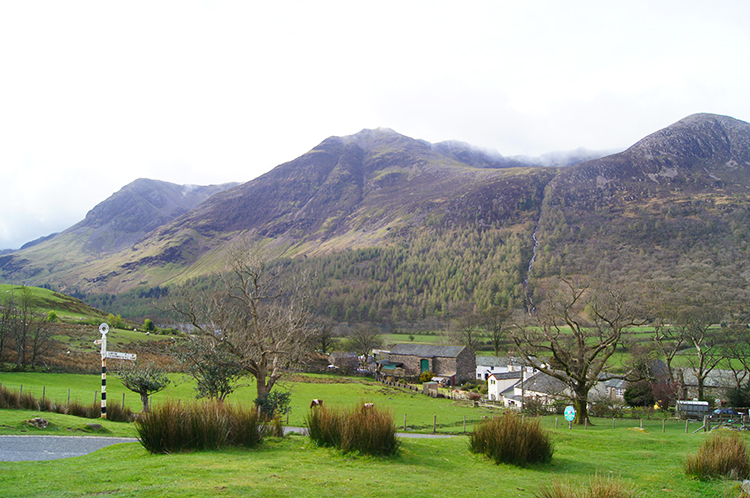 As I did so I chilled out, looking across Buttermere to the village and to Rannerdale Knotts directly behind. I pictured the path down to Rannerdale Knotts from Whiteless Pike via the boil of Whiteless Breast which had taken me from thick cloud and into light on that walk from Buttermere village which I have mentioned earlier in this report, the one that started with Knott Rigg and Ard Crags. That was another good walk though I could rename Whiteless Pike as Whiteout Pike. It certainly was for me. 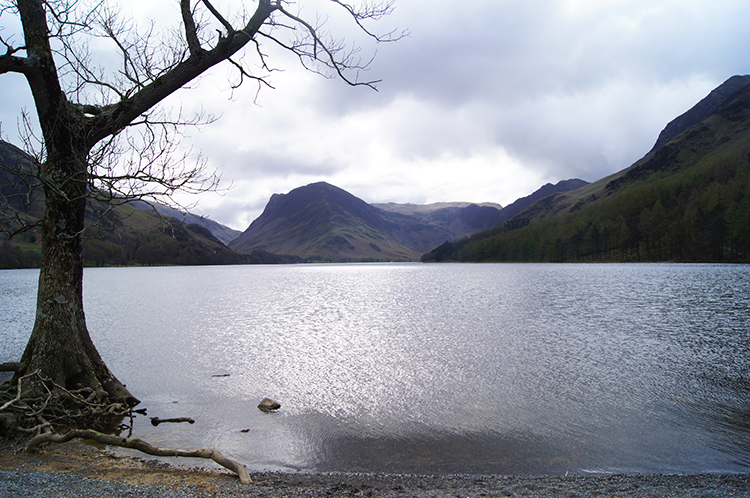 Soon my walk along Buttermere was done. Soon later and after retracing the path back into the village and up to the car park my whole walk was done. Back at the car I could not help looking up to the mountains I had just crossed during my walk. They were still all there, still waiting in line for the next time. Just as I had done at the start of my walk I tipped my head to them.